All individual Policyowners with at least one (1) in-force permanent Insular Life policy (not I-Shield), are eligible to join the Program, except employees, board members and agents. If policyowner has only one (1) policy and this matures at the time of the raffle draw, he is no longer qualified to join the raffle draw. If policyowner has multiple policies, he is qualified to join the raffle draw, as long as 1 policy remains in-force. A Policyowner may invite the designated insured and beneficiaries of his policies to join in the campaign by confirming the insured and beneficiary details of his policies. Insured and Beneficiaries shall be given their own Customer Information Update (CIU) forms where they can record their contact information. Once they submit their updated CIU forms to any Insular Life office, they shall be entitled to one (1) raffle ticket. • Over-the-Counter - Visit any Insular Life Field Office. • Over-the-Phone - Call us at (02)876-1-800 for MM or toll free at 1-800-10-INSULAR (467-8527) for the provinces. • Customer Portal or visit www.insularlife.com.ph , and select Customer Portal. • Go Online through Insular Life’s website www.insularlife.com.ph, and select Customer Portal. • Visit any Insular Life Field Office and enroll Over-the-counter. • Call us at (02)876-1-800 for MM or toll free at 1-800-10-INSULAR (467-8527) for the provinces. ACO is an online premium payment facility that automatically charges your modal premiums to your enrolled MASTERCARD or VISA credit cards, as they fall due. To know more about ACO, click Credit Card Payment facilities. EPOn is an innovative premium payment facility available only at Insular Life where you pay your modal premiums using your EPOn Fund that you build up through monthly deposits using your credit card. To know more about EPON, click Credit Card Payment facilities. ADA is a payment facility that provides the convenience of having your modal premiums automatically deducted from your enrolled bank account, on your preferred debiting date. To know more about ADA, click Auto Debit Arrangement (ADA). Opting to receive online his premium billing notices, SOA, and other correspondences from Insular Life (included in Customer Information Update form). All entries received until the midnight of June 15, 2016 shall be qualified for the Raffle Draws. He has at least one (1) in-force policy (not an I-Shield policy) at the time his name is drawn. He has been successfully contacted on the contact information available in our database. Winners must personally claim their prize within 30 days after the draw. All unclaimed prizes after the prescribed 30-day period shall be forfeited. Prizes may be claimed at any of our field offices after proper advice. A winner may win only once in the Raffle Draw. A representative from the Insurance Commission (IC) will be invited to witness the Raffle Draws. The Grand Prize of P105,000 will be awarded to each of 5 winners. Minor prize of P5,000 will be given to each of 100 winners. All taxes related to the raffle prizes shall be paid by Insular Life. 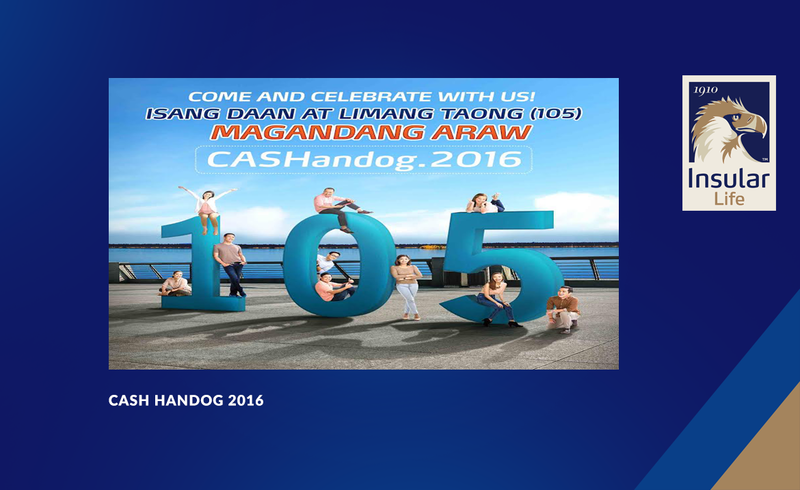 The Program starts on March 15 to June 15, 2016 with raffle draw on June 16, 2016.